« Whatever Happened to Whetstone Gap? It brought back a bittersweet memory of a thing so strange it would be hard to believe if I hadn’t seen it with my own eyes, and so poignant the thought of it brings tears even now, twenty some years later. Sometimes folks do not want to believe what is written in scripture. I believe. And because I believe I expect to find proof of what I believe. I had heard that eagles do indeed bear up their little eagles on their wings when the young ones are learning to fly. I finally found a reliable source on the internet that offered the proof I was looking for. The site is Zoo Torah. The name of the article is “On Eagle’s Wings.” The date is May 7, 2009, and the subject is the nesher, as described in the Bible. In the article is given an account of young eagles being taught to fly by the parent birds. The young birds are sometimes carried on the mother’s back. I did not find any mention of chickens transporting their young ones, nor would I have ever imagined such an act. But God has surprises for us – things that awe and amaze. 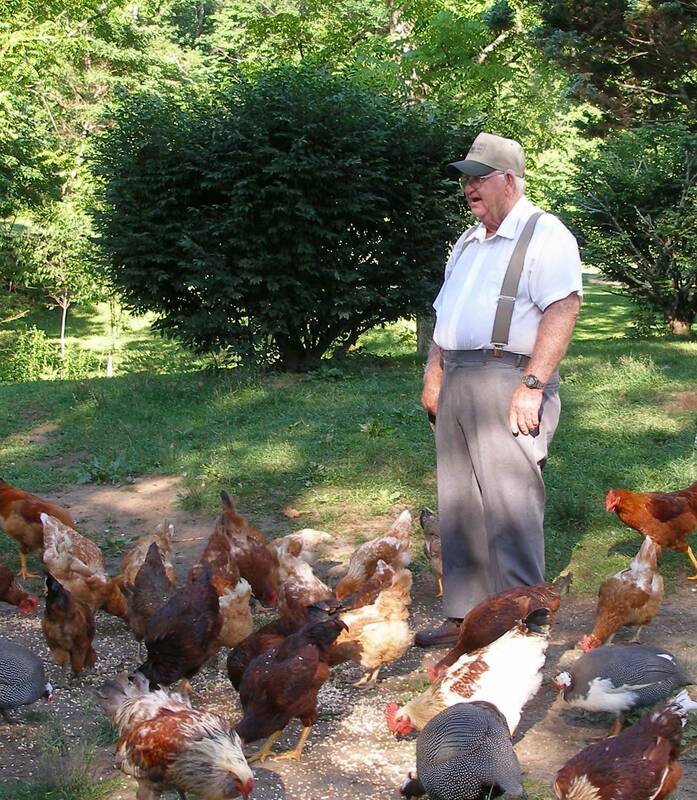 When I lived at the homeplace at Quebec I had several chickens, too many chickens. I thought I was tired of chickens, so I gave them to Fred Owen, all but four hens that he couldn’t catch. I couldn’t catch them either, so they rambled all over the place, scratching up bugs and eating the food scraps I threw out for them. Soon I discovered one of those four hens had managed to hatch about six little ones somewhere out in the wild. How she managed to incubate her eggs for three weeks without getting eaten by foxes I will never know, but she did. The little diddles were beautiful, as all little chickens are. But, one by one those precious little chickens began to disappear. I was horrified one evening to see my house cat dart in and grab one and streak away with it. I won’t blame the cat for the murder of all those little chickens. I don’t know what happened to the rest of them. I do know that besides cats, there are all sorts of wild creatures that prey on young fowl; it is pretty amazing that any wild bird grows to maturity. Did that hen feel the loss of her baby chicks? I have heard of mother cats searching in vain for kittens that have been taken away, meowing and crying constantly until they finally give up hope of finding their little ones. Chickens are not as intelligent as cats; do their hearts break when they loose their own? I don’t know. All I know is that my own heart broke a few days later when I discovered there was only one little chicken left. I was at the barn that evening just before dark. I heard something that caused me to look up, and there, high above me, sat the mother hen and one little diddle, its head and neck peeping out from under her wing. I had to look again to be sure my eyes were not deceiving me. They were about fifteen feet above the ground on a tree limb! Somehow, only God knows how, that mother hen had managed to get her last precious baby up on that high limb. It was the safest place she knew. I have tended chickens, hatched chickens, fed chickens, watched chickens for over twenty years. I KNOW a little chicken can not fly that high. Five feet off the ground would be about the maximum a chicken its size could fly. But there it was, up there on that limb, under its mama’s wing. I could not believe it. I was amazed, awestruck. What kind of love could do that? I cried. Even now I am wiping tears away. I never saw the baby chicken again. Nor were there any more afterwards, for Fred had taken all the roosters. For two or three years those four stouthearted hens eluded predators, survived blizzards, and scratched up a million worms and bugs. They were doing well until they began to scratch in my neighbor’s garden. He didn’t like that very much, so I let him trap them and give them away. I thought that would be the end of the chicken business for me. I should have known it wasn’t. After all, the Lord had already talked to me about chickens … . But that is another story. The only explanation I have regarding this remarkable occurrence is that the little one held to the mother with its little feet as she flew upward. 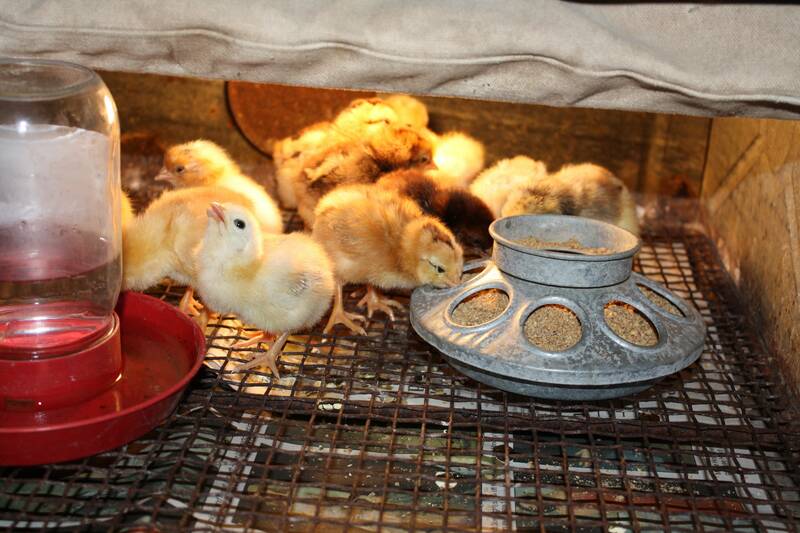 Little chicks do have a good grip, and if provided a small roosting pole will use it when they are still very small.